It is zero degrees out and the snow is falling. As I write this blog, my seven year old daughter is outside standing perfectly still next to the bird feeder hanging from a tree branch. Her hand is outstretched and holding a small pile of black oiled sunflower seeds. The warmth of her bodied is sealed in many layers and a balaclava that is covering her chin, cheeks, and nose. A thick hat sits atop her head and the only part of her body that is uncovered is a narrow band around her eyes. She stands in a winter wonderland of soft flakes and is surrounded by Black-capped Chickadees. One of the little birds lands on her mittened hand and retrieves a seed - the moment she has been waiting weather for, despite the cold! Not long ago I read an article, about Nordic babies and young children in winter. The article shared the sentiment, "There is no bad weather, only bad clothing." I'm sure my daughter would agree and I imagine the children who attend Winter Whispers, a weekly drop-off program, and Forest Preschool would agree as well. I was somewhat surprised when I read the article,The Babies Who Sleep in Sub-zero Temperatures by Helena Lee, that it is a tradition for babies in Norway, Sweden, and Finland, to nap in prams outside - even in winter. In the article, improved health and a theory that babies sleep better and longer outside are described as reasons for doing so. At a preschool outside Stockholm, children spend their entire day doing what they would inside and only go in for meals or unusually cold weather. The article is clear to state, although the weather may be cold, the child must be warm - "It is important to have wool next to the child's skin." Another article entitled, How to Survive Winter in Finland and Enjoy It by Salla Korpela, explains, "The secret to spending time outdoors in the winter is to make sure you are dressed properly." Last Thursday, I woke to pink light and clear skies, and knew the mercury in the thermometer would be low. Even though it was sub zero at the time, when I made my way outside into the sunlight, I was struck by how still the air was and how warm my face felt in the light. At the North Branch Nature Center that morning, a fire was made to warm young bodies upon their arrival at Winter Whispers and used for cooking over later in the morning. Children arrived all bundled up in just the right outerwear to keep their bodies warm. Eager exclamations of “Can I use a shovel too” started off our play and exploration time in the snow. Thermal under ware, bibbed snow pants, fleece or wool sweater, a warm winter jacket, thick wool socks in boots with room to wiggle toes, a snug neck warmer or balaclava, and fleece lined hat with ear flaps did the job keeping all body parts warm! The little ones used child sized snow shovels to move snow and make paths, became nature detectives and followed animal tracks, slid like otters on their bellies, and watched puffs of steam billow around their faces, all the while cultivating resilience and a love of winter. 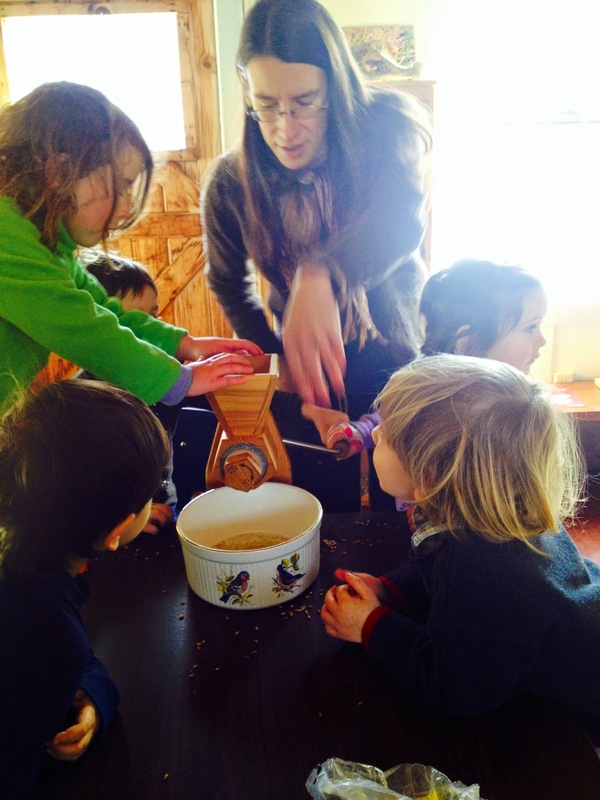 Once inside, to warm during circle and snack, our group was excited to learn they had the opportunity to grind wheat berries into flour, make dough, whittle roasting sticks with a peeling whittler, and bake bread on the stick over an open fire outside. Children used eager hands to grind and feel the soft, powdery texture of flour, stir the dough, and practice fine motor skills by whittling bark off their roasting sticks. 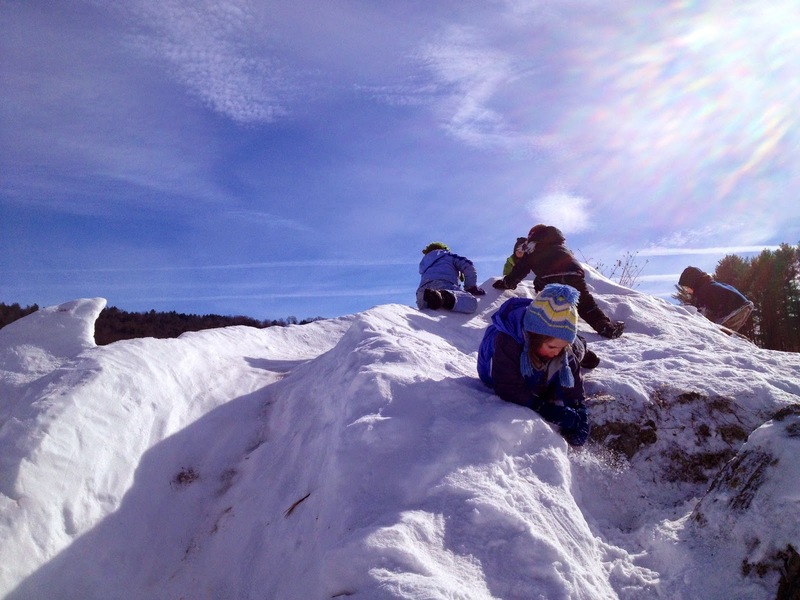 With these tasks complete, and layers back on, our little community of youngsters made their way outside. They happily circled around the fire pit with their bread dough wrapped around a stick and contentedly began to roast the dough until it was a nice golden brown. They did so over coals of softwood with the scent of cedar filling the air. Golden honey was drizzled over the their freshly baked bread and together the group enjoyed the treat under a winter blue sky streaked by jet plane streams and wispy cirrus clouds. Afterwards, with bellies and bodies warmed and full, we made our way through a field to explore a large quinzee and several igloos on our land afforded to us by the Ice on Fire celebration. 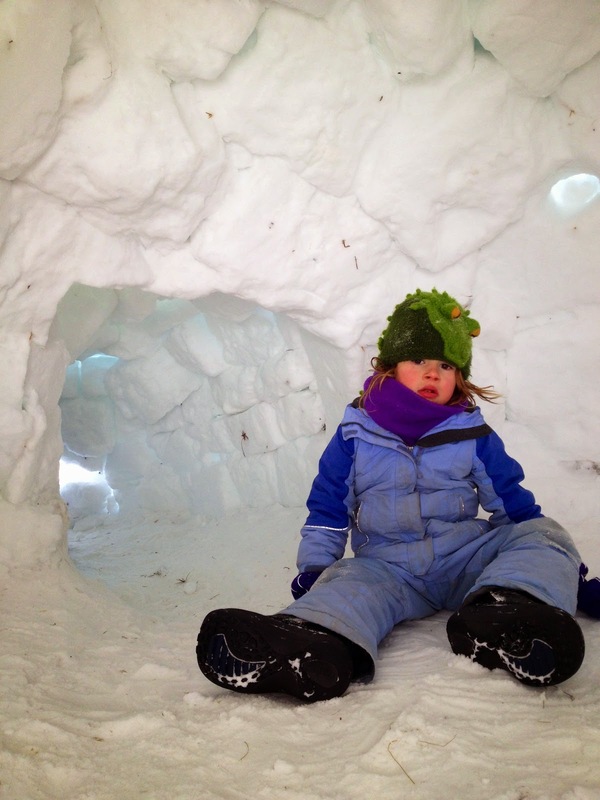 Children were thrilled to explore inside the frozen abodes. 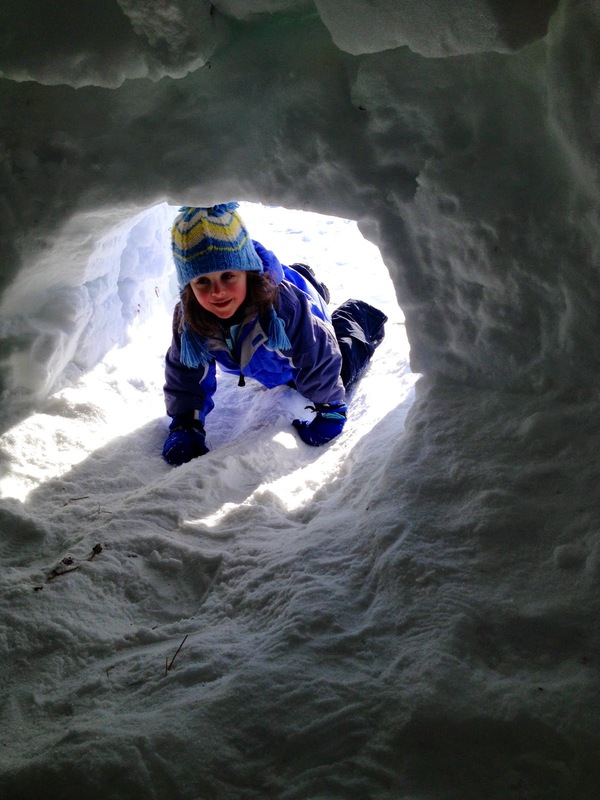 They exuberantly scaled up the quinzee's mountainous pile of snow and slid down. A maze of Christmas trees made for exciting hide and seek and imaginary play. The winter morning ended in song under a bright sun with smiles wide. The only long faces we saw belonged to those who were disappointed that it was time to go home. Now that snow is piling up outside, many more winter delights await Winter Whispers in the coming weeks. Perhaps, donning our winter layers, we will hold out mittened hands piled with black oiled sunflower seeds in hopes a chickadee will eat out of our hands. 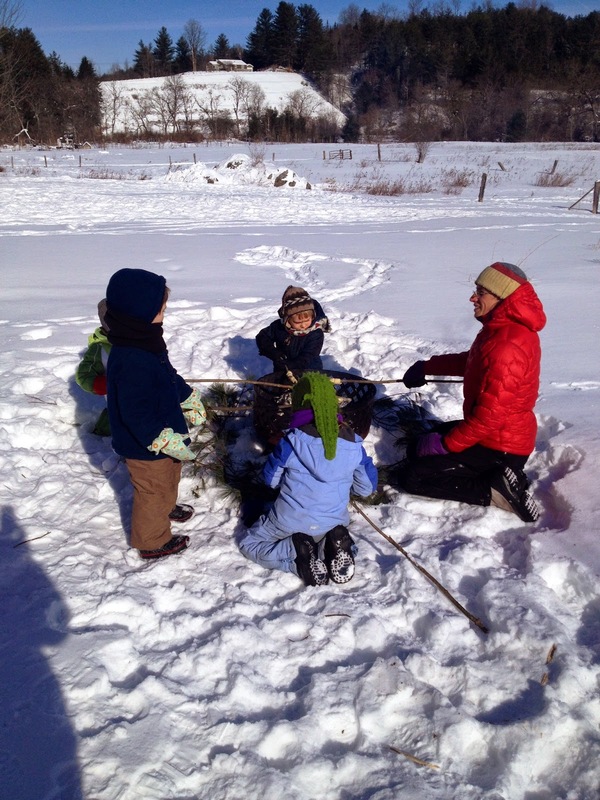 One thing is for sure, with warm toes and fingers, we will continue developing winter self-care skills, resilience, and a love of the great outdoors in Vermont during this frosty time of year. As a parting thought, I leave you with the ending of The Babies Who Sleep in Sub-zero Temperatures: "Another saying sums up what Swedes are likely to think when toddlers in other countries are kept indoors in sub-zero (Celsius) temperatures: "A little fresh air never hurt anyone."